Capacity 200GB Compressed 2:1. Recording technology LTO-1 Ultrium. All hard drives are fully tested by performing a HMG Infosec Level 5 wipe on them. Everything is fully tested unless otherwise stated. Many causes of recording or read errors are temporary and can be corrected by cleaning the tape drive. It is specifically designed to work with all LTO Ultrium Tape Drives. This product has been tested and validated on Dell systems to ensure it will work with your computer. VERBATIM 93827. 100 - 200Gb. GENUINE SEALED BOX of 5. 1450g 15 x 12 x 12 cm. In most cases, the picture supplied will be of the actual item. ~~~~~~~~~~~~~~~~. Original & Compatible. Toners / Inkjets / Fusers / Maintenance kits etc. Credit or Debit card over the phone. Printers & Consumables. Printer Spares. Power Tools. Photocopiers Accessories. PDA's & Accessories. PC Systems. PC Software. Imation 41089 [New]. ModelBlack Watch. New And Sealed x5 Imation LTO-1/Ultrium-1 Data Tape/Cartridge 100/200GB NEW. Condition is New. Dispatched with Royal Mail 2nd Class. Original HP manufacture with a storage capacity, using 2:1 compression, of 1.6TB (800MB uncompressed). Can easily be write-protected to avoid accidental overwriting of critical data, by using a physical switch that is not reliant on software to perform the protection. Tape type: LTO, Compressed capacity: 6250 GB, Data compression: 2.5:1. Tape size: 1.27 cm, Tape length: 846 m, Tape thickness: 6.4 µm. HP Enterprise blank data tape LTO 1.27 cm. • Write-Once-Read-Many (WORM) version provides tamperproof, compliant data storage. HP Enterprise LTO4 Ultrium 1.6TB WORM LTO 1.27 cm. Tape type: LTO, Compressed capacity: 1600 GB, Tape durability: 1000000 pass(es). Tape size: 1.27 cm, Tape length: 820 m, Tape thickness: 6.6 µm. Covering five generations of capacity - LTO-1 (200 GB), LTO-2 (400 GB), LTO-3 (800 GB), LTO-4 (1.6 TB) and LTO-5 (3 TB) - and with transfer speeds of up to 1 TB/hr for LTO-5, there is a platform for every need and budget. Quantum blank data tape LTO 1.27 cm. Quantum MR-L3MQN-01. Tape type: LTO, Compressed capacity: 800 GB. Transfer rate: 160 MB/s. Tape size: 1.27 cm, Tape length: 680 m, Tape thickness: 8.9 µm. Prodotti 100% originali, nuovi di zecca - eeemarket non vende prodotti usati o contraffatti - MAI! As shown in the photos. All parts contained in this item have been security marked and where applicable serial numbers noted. 2 x Low Profile Slotbleche Slot Blende zur Abdeckung für Gehäuse Low-ProfileEUR 1,7900. Technische Daten. bis zu 100GB. 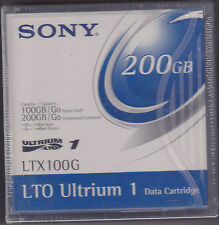 Ultrium LTO 1. bis zu 200GB. Sie sind zur Rückgabe gebrauchter Batterien als Endnutzer gesetzlich verpflichtet. Capacity: 100 GB (native) / 200GB (compressed). Transfer Speed: 20MB/sec (native) / 40MB/sec (Max. ). SCATOLA CON 4 PEZZI DI CARTUCCE LTO ULTRIUM 1 NUOVE. This product is non-custom labelled. Capacity Compressed: 200GB. Tape Type: LTO. Form Factor: LTO Tape. Tape Length: 609m. Tape Thickness: 8.9m. MPN C7971A. Model C7971A. Aucune commande ne sera expédiée le week-end. The Sony LTX100G LTO-1 Ultrium tape is compatible with LTO-1 and LTO-2 tape drives and autoloaders in both read and write mode. The Sony LTX100G is also compatible with LTO-3 tape drives and autoloaders in read mode. Sony 20LTX1500GNLP. Tape type: LTO, Compressed capacity: 3000 GB, Coercive force: 230 kA/m. Transfer rate: 140 MB/s, Compressed transfer rate: 280 MB/s. Tape size: 1.27 cm, Tape length: 846 m, Tape thickness: 6.4 µm. Dell 9W084 [New]. Part Number09W084. 3 data cartridges for grabs. Overview Exhaustively tested, HP LTO Ultrium cartridges meet all your demands for maximum reliability when restoring data, offering high storage density, ease of management and scalable storage and backup performance. Vue d'ensemble Testé, cartouches HP LTO Ultrium répondent à toutes vos exigences pour une fiabilité maximale lors de la restauration de données, offrant stockage haute densité, de la facilité de gestion et de stockage évolutif et performances de sauvegarde. Plus haute capacité et les performances de n’importe quel ruban comparables Technologie â ¢ HP Ultrium LTO-6 peut écrire ou lire des données à a blistering 1. Cardboard boxes opened for photos only. Highest Capacity and Performance of any Comparable Tape Technology â¢ HP LTO-6 Ultrium can write or read data at a blistering 1.4 TB/hour, storing, encrypting and protecting up to 3 TB on a single cartridge, making it the big hitter in large-scale, 24x7, mission-critical IT environments. Ref No 400260. MAXELL ULTRIUM 1. ~~~~~~~~~~~~~~~~. Original & Compatible. Toners / Inkjets / Fusers / Maintenance kits etc. as well as older and hard to find -. 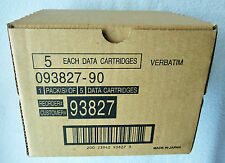 HP LTO Ultrium 4 WORM Data Cartridges. Condition is New. Dispatched with Royal Mail 2nd Class. Item model number: 09W084. 100GB Native - 200GB Compressed. LTO-1 Blank Tape. Hard Drive Size: 100 GB Uncompressed - 200GB Compressed. Product Overview. Capacity: 100GB Native, 200GB Compressed. Modell C7971A. Speicherkapazität 200GB. Format LTO-5. Stückzahl 5 Stück. Die Geräte sind technisch und optisch in einem einwandfreien Zustand. und haben diesen selbstverständlich einwandfrei bestanden. Tandberg LTO 1. (in Folie eingeschweißt). Speicherkapazität ohne Datenkomprimierung: 100 GB. Speicherkapazität mit Datenkomprimierung: 200 GB. Fabricant: Tandberg Data. Speicherkapazität 320 GB. Marke MAXELL. Vous recevrez une facture avec TVA 19%. Compte affecté avec des TVA est évident pour nous. Largeur de bande: 0.50 ". Banque transfert. Genuine HP New and Sealed. Manufacturer: TANDBERG DATA. Storage Capacity: 100 GB/200 GB. Tape Length: 1833.50 ft Storage. Bank Überweisung. Die Geräte sind technisch und optisch in einem einwandfreien Zustand. Tape Width: 0.50".